Blue Apron is slowly becoming one of the best meal kit services for vegetarians. Not long ago, it only featured one or two veggie dishes on its 2-person menu, with no vegetarian options for families. Now, nearly half of the dishes on its weekly menus are vegetarian-friendly. 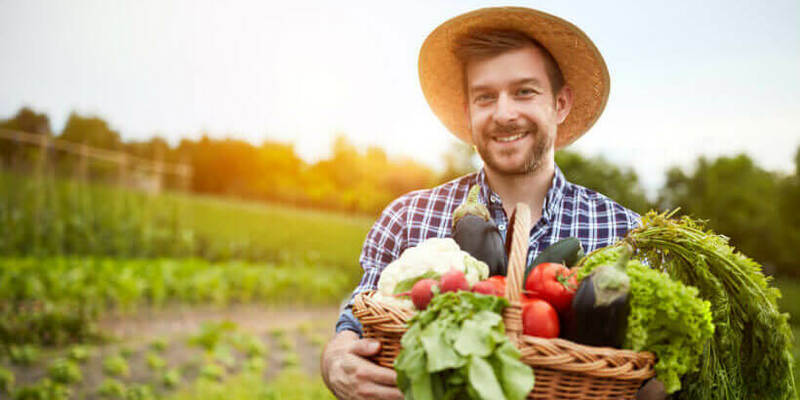 If you are a veggie-lover in search for a good source of innovative recipes and fresh, natural ingredients, keep reading and find out what makes Blue Apron vegetarian recipes some of the best on the market. Those who have already browsed Blue Apron’s offer know that this company brings you some of the most creative, exciting, and delicious recipes for vegetarians. The company offers at least 3 chef-crafted vegetarian recipes per week, all yielding 2 servings. Most of them are inspired by the Mediterranean, Mexican, and Asian cuisines. Usually, Blue Apron vegetarian recipes feature dairy, including aromatic cheeses like cheddar, labneh, and pecorino. The Asian-inspired recipes usually feature eggs. You can expect plenty of innovative twists on traditional and classic dishes, like quesadillas, tacos, ramen, and all kinds of comforting street food from around the world. Blue Apron vegetarian recipes are always easy to make and they are usually rather quick. You rarely have to spend more than 30-40 minutes in the kitchen and the hands-on time is usually around 15 minutes. The recipes normally include 6 steps, described in great detail and accompanied by photos that show you what your meal should look like at each stage of the process. In addition to the list of ingredients with exact quantities and the detailed steps, you get a list of the kitchen tools you need in order to prepare the meals. In case you do not have a tool or two in your kitchen, you can purchase them at the Blue Apron shop. To help you easily turn your meal into a special dinner for two, Blue Apron offers excellent wine pairing suggestions. You can purchase the suggested wines at the shop of your choice or simply have them delivered to your doorstep by joining the Blue Apron wine club. Blue Apron vegetarian recipes make perfect use of all the seasonal goodness that regularly arrives at the Blue Apron kitchen. They feature exciting combinations of natural and organic produce, whole grains, the finest cheeses, and farm-fresh eggs. They are nutritionally balanced, with the perfect ratio of all macronutrients, and they are rich in valuable phytonutrients. Furthermore, they are incredibly satisfying and keep you full for hours. Usually, the calorie count ranges between 500 and 800 calories per serving. For those of you who have not yet had the chance to try out Blue Apron vegetarian recipes, we have decided to tickle your fancy with a couple of our favorites. Inspired by well-loved Mexican street food, these beautiful vegetarian tostadas are packed with nutrients and exciting flavors. They feature a combination of cotija cheese, poblano peppers, summer squash, and red onion, all creamy and infused with the aroma of Mexican spices, served atop refreshing cilantro-lime rice lying on crispy corn tortillas. The dish takes about 35 minutes to make. Pasta is the definition of comfort food. This elegant vegetarian dish is as satisfying as it gets. It features a variety of delicious, earthy mushrooms, including cremini, shiitake, maitake, fanned oyster, and dried porcini. Combined with tangy tomato paste and the bold pecorino cheese, it is incredibly aromatic and pleasing to the senses. A great choice for weeknights, when you need something both comforting and quick to cook. Although stuffed squash is mostly enjoyed during the winter, when the weather is cold and you need something to keep you feeling warm and cozy, this Thai-inspired version goes to prove that a dish as good as this can be enjoyed all year long, regardless of the season. 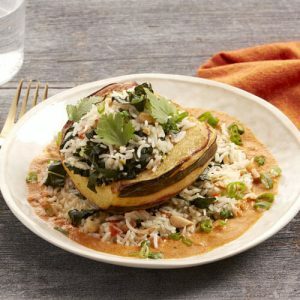 The sweet roasted acorn squash is filled with delicate basmati rice, collard greens, and crunchy peanuts. It is then laid upon creamy and spicy red curry which contrasts the smooth flavor of coconut with the warm aroma of red curry paste, making it a real treat for the taste buds. If you want to take the meal to the next level, serve it with a bottle of Riesling or Pinot Gris. These are just some of the beautiful Blue Apron vegetarian recipes that you can try out, with new ones appearing on the menu every week. Each of them is unique and thrilling and a new chance to improve your cooking skills, introduce variety into your diet, and discover your new favorites. We hope that we have inspired you to try out something new today. Happy cooking! Shown above are just some of the beautiful Blue Apron vegetarian recipes that you can try out, with new ones appearing on the menu every week. Each of them is quick, healthy, tasty, unique, and thrilling, providing you with a chance to improve your cooking skills, introduce variety into your diet, and discover your new favorites. We hope that we have inspired you to try out something new today. Happy cooking!